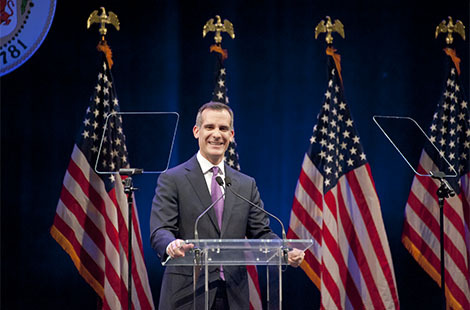 CSUN’s Valley Performing Arts Center provided an elegant backdrop for Los Angeles Mayor Eric Garcetti’s State of the City address, during which the mayor covered subjects ranging from the boom in the tech sector, the historic drought and a planned expansion of social services. Read more about the State of the City Address . Charles Noski and his wife, Lisa, have been actively involved with CSUN for many years, supporting a variety of educational and other initiatives. Most recently, they created the Noski Family Scholarship, which will annually grant four accounting students the opportunity to pursue their business education at CSUN. Read more about the Noski Family Scholarship. Join President Dianne F. Harrison at the launch of a new positioning platform and updated graphic system, including a new university logo. The newly defined messaging and identity standards elevate CSUN’s growing impact and national reputation. In an open letter to the campus community, Timothy White, Chancellor of the California State University, has invited feedback for the three-year review of CSUN President Dianne F. Harrison. Comments are due May 8. For more information, see the letter from the Chancellor. For Your Information this week features information about the Reputation and Visibility Campaign Launch, CSUN Night at Dodger Stadium and the 2015 Honored Faculty Reception.